Over the summer I decided it was time to open my very own Etsy shop. I was apprehensive at first, a lot of my artwork is large and not shipping friendly. Plus it’s a very competitive market, and I had no idea what percentage Etsy would take from my sales. Despite these considerations I went ahead, and finally did it. I put up my large artwork first, and slowly began adding more realistic items such as my jewelry display and stationary. I made my very first sale in Novemeber, and have made a few more since. It feels great to see that e-mail from Etsy waiting in my inbox, “Congratulations on your sale!”. If you are considering opening a shop, but have some reservations, just do it! I’m not making thousands of dollars at the moment, but I am making a little extra money. And, as I found after my first sale, Etsy doesn’t take a large portion of your sale. It cost me $0.20 to post my product, and they took $1.50 from a $45 sale, which is nothing compared to boutiques and museums. Although I am pleased with my recent jewelry and headband holder sales I am missing making art. I decided it was time to put up more realistic sized artwork I could actually ship across the United States, or to other countries; which brings me to today’s post, my recent mixed media spree. Awhile ago I had my wonderful husband make me five wooden canvases, the plan was to play with encaustic wax the following weekend, and pump out a few paintings. Unfortunately work and life in general got in the way, and my wood canvases sat in the corner for months. I finally found spare time, and some encaustic themed Christmas presents motivated me to get to work. 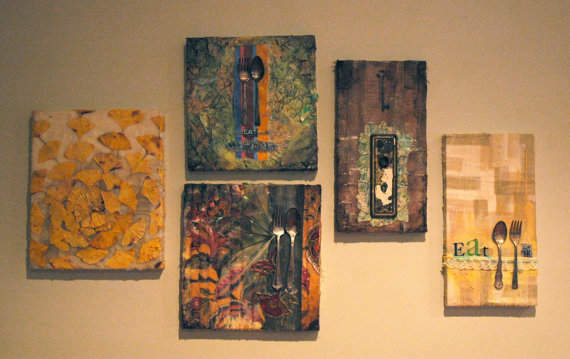 I had three main goals in creating these mixed media pieces: 1. 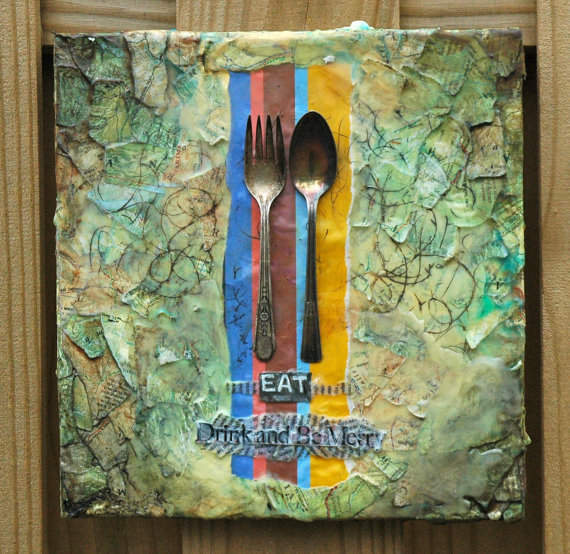 Use encaustic wax on the entire piece, 2: Use unusual materials like forks, spoons, leaves, and paper, and 3. Create pieces I could sell for under $100 on Etsy. 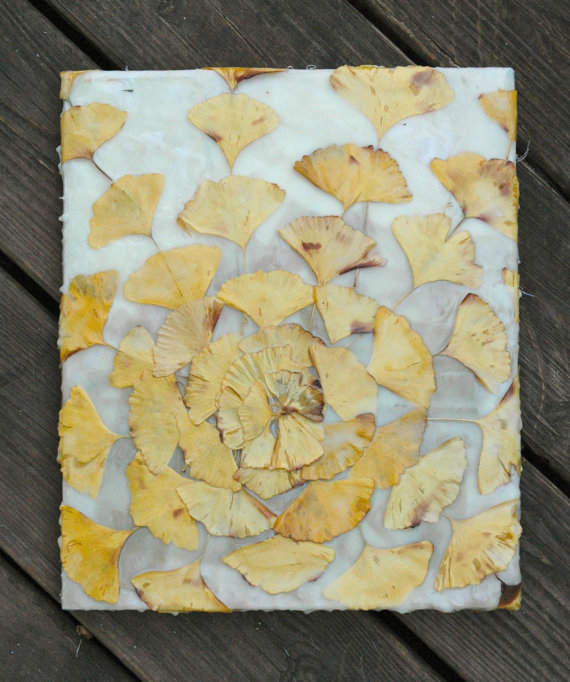 I did list the ginkgo leaf piece for $125, but other than that I felt it was a successful mixed media art experiment. 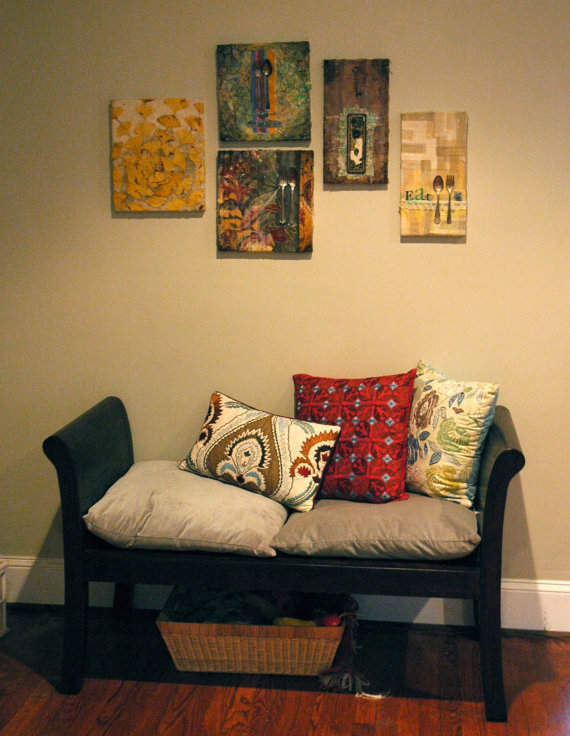 I love how I can apply my visual journaling skills to a piece that can hang on the wall. I decided to hang them in my house until they sell, which will also be a good motivation tool. Whenever a piece sells I will have to produce another piece to fill the empty space. This piece is made by layering strips of fabric, encaustic wax, letters and images cut from magazines, lace, ribbon, a fork, and a spoon. For this piece I wanted maintain the texture and pattern in the fabric, so I layered clear encaustic on top of the strips of fabric. I then took dried leaves, and placed them on top, along with a section of the pattern cut out. 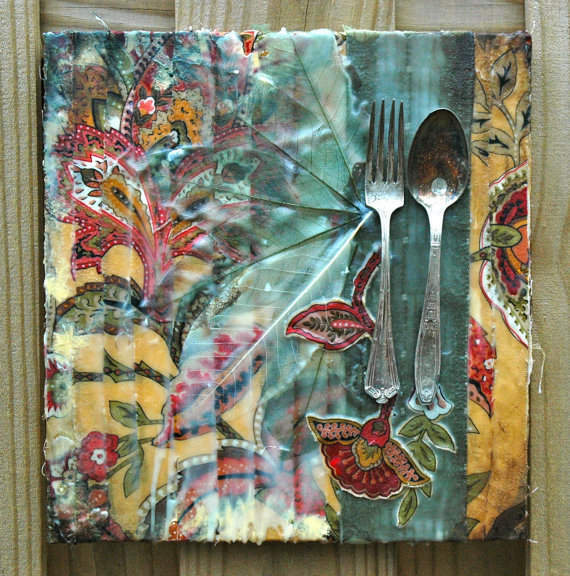 I then put another layer of encaustic and added the fork and spoon. This piece was a long time in the making. It began with a visit from my Mom. She loved the bright yellow leaves falling from our ginkgo tree, and she began collecting them to take home and use in her artwork. Inspiration struck and I also began collecting leaves, and pressed them between books for a couple of months to help flatten them. For this piece I layered strips of neutral fabric in the background and glued the ginkgo leaves on top to create the circular pattern. I then put a layer of clear encaustic wax on top. This piece might be my favorite of the series, I love the composition and color. To create this piece I layered burlap with ripped up maps. I then added layers of clear, naples yellow, and white encaustic wax. 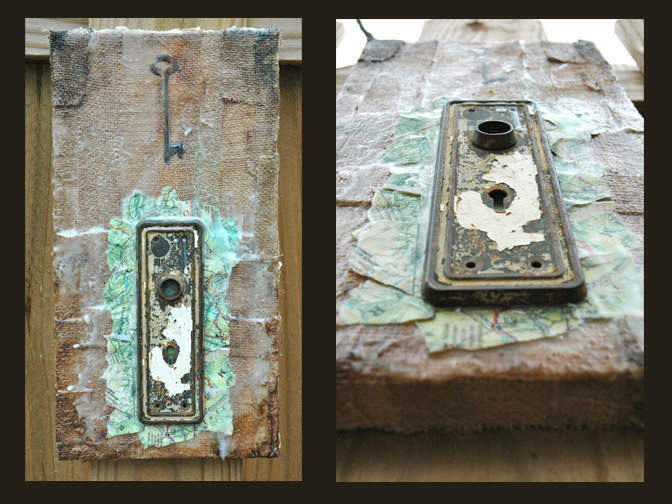 Once everything cooled down I added an image transfer of a key and glued down the antique door handle mount. To create this piece I ripped up and glued down old maps, colored stripes, and words cut out of magazines. 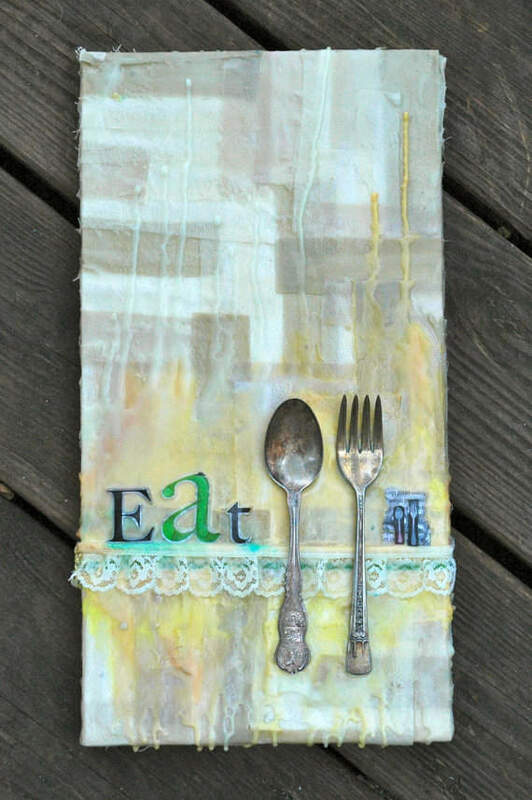 I then added layers of green, yellow, and brown encaustic wax and the fork and spoon. If you love these pieces and want more information on them check them out at my Etsy shop here! I hope you enjoyed today’s post! If you have questions or comments please e-mail me or comment below! As always please like, tweet, subscribe, etc. if you feel compelled! Thanks for stopping by!